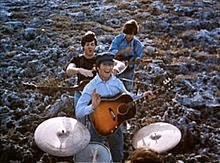 The Beatles Fact for "Because" is that it is a Lennon composition recorded for the Abbey Road LP. Lennon's inspiration for the song came while listening to Yoko play Beethoven's Moonlight Sonata on the piano. He then wrote the song based on the chords played backwards. Lennon said that "the lyrics are clear, [with] no imagery, no obscure references." Harrison and McCartney said it was their favorite song on the album, although Lennon later said he was not satisfied with the arrangement. George Martin explained that John, Paul, and George laid down the basic track and then overdubbed it twice, producing a nine-part harmony--three voices recorded three times. The song can be heard on Beatles Anthology 3 with only the vocals. The harmonies were rehearsed at great length. The song was recorded on August 1, 1969 at Abbey Road, with the overdubs done on August 4 and 5. McCartney played bass, Lennon lead guitar and harpsichord, and Harrison Moog synthesizer. All three Beatles sang lead and harmony vocals.